This a list of sponsors that have only appeared in Mario Kart 8 and Mario Kart 8 Deluxe. For other sponsors that have appeared in these games, as well as at least one other title, see List of recurring sponsors in the Mario Kart series. A 1 Up Racing logo. 1 Up Racing is a sponsor that appears in Mario Kart 8 and Mario Kart 8 Deluxe. The logo for the company, which appears to be simply a racing sponsor, consists of the word "1 UP" in green pixelated writing, with the word "Racing" in a handwritten script font below. The logo is in green and white, the same colors as the cap of the 1-Up Mushroom, and is always on a circular backdrop, like the spots from the 1-Up Mushroom's cap. One variant of the logo does not show the full circle, while another one uses gray instead of green and bring the circle to a point at the bottom. It is the only sponsor in the game to be only advertised on vehicle bodies and not in any courses. 1-Up Fuel is a fuel company that appears as one of the sponsors in Mario Kart 8 and Mario Kart 8 Deluxe. The company presumably produces fuel for the Karts, Bikes and ATVs in the game from or using 1-Up Mushrooms. Despite being named 1-Up Fuel, the Mushroom depicted in its logo more closely resembles the color scheme of a Mini Mushroom, as it is a mid-blue with white spots. It is advertised by means of trackside banners, posters and is also included on a map. 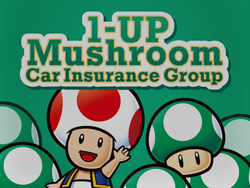 The 1-Up Mushroom Car Insurance Group is one of the sponsors that appears in Mario Kart 8 and Mario Kart 8 Deluxe. The company presumably acts as an insurer for the Karts, Bikes and ATVs in the game, and probably uses 1-Up Mushrooms to regenerate any damaged or broken vehicles. The posters advertising the group feature Toad with six 1-Up Mushrooms, though the face can only be seen of one of them. It is advertised using posters, signs and is also included on a map. 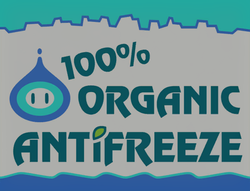 100% Organic Antifreeze is a sponsor in Mario Kart 8 and Mario Kart 8 Deluxe that produces antifreeze for the various Karts, Bikes and ATVs in the game. Presumably, the company produces the antifreeze using or from Ice Flowers. The posters and logo feature the head of an Ice Flower stylised to look like a droplet melting from the ice at the top of the poster into some antifreeze at the bottom of the poster, and the dot on the "I" in "Antifreeze" has been replaced with a leaf from the flower. Another variant is simply a red version of the Ice Flower droplet, while a different one similar to the trackside banner also appears, which uses the same layout but with a plain blue background and white text. It is advertised by means of trackside banners, posters, varnishes and is also referenced on a map. A 100% Organic Antifreeze trackside banner. A 100% Organic Antifreeze logo. BaNaNa Boy is a banana-based drink company that appears as a sponsor in Mario Kart 8 and Mario Kart 8 Deluxe. The company has two different trackside banners which it uses to advertise, which only differ by the color of the background and speech bubble. One of the color schemes is red with a green speech bubble, while the other is green with a red speech bubble. They both feature a Banana saying the tagline "Let one slip!" alongside the company's name, which is in the same green, yellow and orange gradient as the Banana itself in a script font. It is advertised by means of trackside banners, cans in vending machines and is also mentioned on a map. Bob-omb Plugs are a type of plug which appears as a sponsor in Mario Kart 8 and Mario Kart 8 Deluxe. The company produces plugs which resemble Bob-ombs, but replace the fuse with the plug pin itself. Although the official logo is not seen within any of the courses, some graffiti can be seen in Super Bell Subway which shows what is presumably a stylised version of the logo. This graffiti depicts it with a plug on the right hand side, the word "Bob-omb" in all capitals and blue on the left with the word plugs, also stylized in all capitals, below the plug on the right in pink. A Chain Chomp Racing Chains trackside banner. Chain Chomp Racing Chains is a sponsor that appears in Mario Kart 8 and Mario Kart 8 Deluxe. The company presumably produces racing chains from the chains on the back of Chain Chomps for the racers to use. The trackside banners feature the Mario Party 8 artwork of a Chain Chomp, alongside the word "Chain Chomp" in red and "Racing Chains" underneath it in black. The chain at the top of the trackside banner is the same one from the Chain Chomp artwork, just rotated. A variation of this logo consists simply of the name in white on a dark blue background. The company is advertised by trackside banners, appears on a varnish and is also referenced on a map. A Chain Chomp Racing Chains logo. A Ghost Clock trackside banner. Ghost Clock is a sponsor that appears in Mario Kart 8 and Mario Kart 8 Deluxe. The logo features the company name written in a crooked brown font, with the "L" in clock being made from two clock hands. It is advertised using trackside banners. Golden Wheel is a sponsor that appears in Mario Kart 8 and Mario Kart 8 Deluxe. Presumably, the company provides the steering wheels and equipment for the various vehicles in the game. The logo of the company consists of an image of a golden Wii Wheel, next to the company's name in gold writing on a black background. It is advertised by means of trackside banners and signs. A Green Service trackside banner. Green Service is a gardening company that appears as a sponsor in Mario Kart 8 and Mario Kart 8 Deluxe. Presumably, the company manages the plants around the courses, specifically the lawns, and appears to use Munchers to do it. The logo consists of the company name in a curved green font above several Munchers, on either a blue or white background. It is advertised by means of trackside banners and is also referenced on a map. The side of an Iggy's Glass truck. Iggy's Glass is a sponsor that appears in Mario Kart 8 and Mario Kart 8 Deluxe. The company, which is run by Iggy Koopa, produces glass, specifically windshields, and has the slogan "Crystal Clear Windshields". The logo is stylized to look like Iggy's glasses, which appear in the middle, as the company name is written in white with a black outline, similar to the pupils, then have a line of white and then blue, followed by more white, like the rest of the eye and have a complete black outline, like the glasses frames. The slogan appears underneath in purple writing with a white outline, and the background uses the same dark to light green gradient as his hair. It is advertised by means of trucks. A Kung Fu Lakitu poster. Kung Fu Lakitu is a film that appears as a sponsor in Mario Kart 8 and Mario Kart 8 Deluxe. 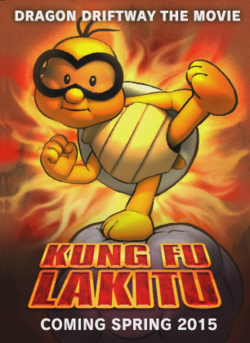 The film is a reference to the 2008 DreamWorks film Kung Fu Panda, as the poster uses a similar name and font, and the Lakitu is in the same pose as Po on the original poster. The poster also says "Dragon Driftway the Movie", which is a course from the other DLC pack that has a similar theme, and also features multiple statues of Lakitus practising kung fu, similar to the image on the poster. The poster also says "Coming Spring 2015" referencing the release date of the second DLC pack in which it appeared. The main image on the poster depicts a Lakitu stood on his cloud performing a side kick, surrounded by flames in front of some mountains. The title is written in capital letters, using a red font with a gold outline at an angle, while the rest is written in a white font. It is advertised by means of posters. Larry Lights is a sponsor that appears in Mario Kart 8 and Mario Kart 8 Deluxe. Presumably, the company produces lights and is run by Larry Koopa. The logo consists of the company name in a curved font either side of a white version of Larry's kart emblem, with a star off to the left. The logo is in a white oval, though parts of Larry's emblem stick out, on a black background. It is advertised by means of signs and logos. A Lemmy's Tire Service sign. Lemmy's Tire Service is a sponsor that appears in Mario Kart 8 and Mario Kart 8 Deluxe. 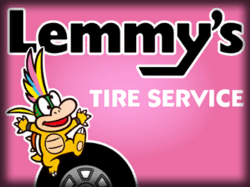 Presumably, the company, run by Lemmy Koopa, provides and puts Tires on the vehicles in the game. The main logo consists of the word "Lemmy's" in a sans-serif font, with a more angular "Y", in black with a white outline, and "Tire Service" in a different all-capitals font below, also in white. The logo also features a 2D image of Lemmy bouncing on a Tire with a white overall outline, on a pink or green background. The image of Lemmy originates from an artwork of the Koopalings, Bowser and Bowser Jr. on an Airship, but this version does not have shading and the whole image can be seen. As a consequence, this artwork depicts Lemmy with a lazy eye, a trait which he is missing in the game. The logo also has some variants, the main one being the bottom of the "Y"'s outline being extended to incorporate the rest of the sponsor's name on the same line. The rest is then rearranged to fit the trackside banner. The color also changes, with the rest of the writing being changed to green, or the word "Lemmy's" being changed to green. Another variant retains the main trackside banner text composition, but changes the color to red and puts it on a dark blue background. It is advertised by means of trackside banners and signs, appears on varnishes and is also referenced on a map. A Lemmy's Tire Service trackside banner. A Lemmy's Tire Service logo. 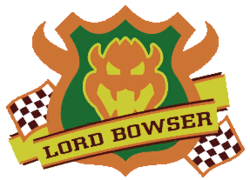 Lord Bowser is Bowser's racing team and a sponsor in Mario Kart 8 and Mario Kart 8 Deluxe. It is one of the six racing teams for each of the characters that have appeared in every Mario Kart game since Super Mario Kart. The logo consists of an orange version of Bowser's Kart emblem, with a yellow outline on a green shield with an orange outline with horns. The shield has a yellow banner running across it with an orange and brown, with the team name in in all capitals in the same brown as the outermost trim. The logo also includes two brown and white checkered flags with an orange outline at the bottom. The team is represented using crowd banners, vans, logos and also appears on various standings boards. Ludwig Painting is a sponsor in Mario Kart 8 and Mario Kart 8 Deluxe. It is presumably a painting company run by Ludwig von Koopa, which is most likely responsible for the graffiti in Super Bell Subway. The company's official logo is not seen in any of the courses, a stylized version of the logo appears among the graffiti in Super Bell Subway. The stylized version shows the company name in a pale yellow green font with a black outline and shadow on a blue shape resembling Ludwig's hair. It is advertised by means of graffiti, and is also referenced on a map. 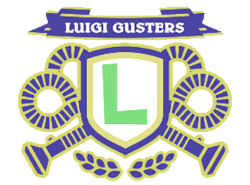 Luigi Gusters is Luigi's racing team and a sponsor in Mario Kart 8 and Mario Kart 8 Deluxe. It is one of the six racing teams for each of the characters that have appeared in every Mario Kart game since Super Mario Kart. The logo consists of a white shield with Luigi's green "L" on it with a gold and blue border. On either side of the shield are blue hoses and nozzles with gold outlines, similar to the vacuum attachment of the Poltergust 5000 which the team is most likely partly named after. Underneath the shield is a blue and gold laurel wreath, and above it is a blue and gold banner with the team name written on it in white. The team is represented using crowd banners, trucks and hot air balloons, and also appears on various standings boards and in pit areas. Mario Automobile Association trackside banners. The Mario Automobile Association (often abbreviated to MAA) is a sponsor that appears in Mario Kart 8 and Mario Kart 8 Deluxe. Presumably, the company is an insurer for the vehicles used in the game, and uses Fishin' Lakitus to recover the Karts, Bikes and ATVs. 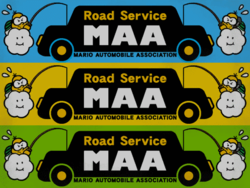 The logo features a pair of Lakitus lifting a black car with yellow details, which says "Road Service" on it in yellow and "MAA" on it in white. Beneath the vehicle the company's full name is written in black. The logo appears mainly on a blue background, but also appears on green and yellow variants. The artwork of the Lakitus is based on one from Mario Kart: Super Circuit. The company is advertised using trackside banners, signs and promotional tents. The top of a Mario Automobile Association promotional tent. 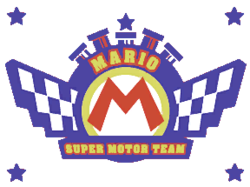 The Mario Super Motor Team logo. The Mario Super Motor Team is Mario's racing team and a sponsor in Mario Kart 8 and Mario Kart 8 Deluxe. It is one of the six racing teams for all of the characters that have appeared in every Mario Kart game since Super Mario Kart. The logo consists of Mario's "M" emblem surrounded by gold and blue rings, with "Mario" written in gold with a red outline at the top. the rest of the team's name is written in a rectangular banner that goes across the bottom of the circle. On top of the rings are five blue Warp Pipes, two of which have blue shading, and the middle one with a Super Star above it. Two shapes that resemble checkered flags or finish lines appear on wither side of the logo, and a blue star also appears in all four corners of it. It is represented by means of trucks, logos, crowd banners, hot air balloons, gasoline pumps, and also appears in pit areas, on standings boards and is referenced on a map. Morton Construction is a sponsor that appears in Mario Kart 8 and Mario Kart 8 Deluxe. The company is presumably run by Morton Koopa Jr. and carries out construction work and provides construction equipment and tools. Their main logo consists of the company name in all-capital white sans-serif font and the first "O" in "Morton" replaced with a yellow Morton emblem, on a black background with yellow danger stripes at the edges. On the right hand side of the logo is a 2D picture of Morton wearing a yellow builder's helmet. The main variant is the trackside banner one, with the only changes made is the placement of Morton in the middle and the rest of the logo either side. One of the other two variants simply consists of the text as usual on an orange background, while the other variant changes the color of the text and emblem to blue and puts it on a yellow background. It is advertised by means of signs, trackside banners, drills and containers, and is also referenced on a map. However, the map in Super Bell Subway incorrectly names the company, and is spelled as "Moton Construction". A Morton Construction trackside banner. Paratroopa Airlines (often abbreviated to PAL) is a sponsor that appears in Mario Kart 8 and Mario Kart 8 Deluxe. The company, presumably run by Koopa Paratroopas, appears to run flights to some of the courses in the game, so presumably transports the racers to these locations for the races. The main logo consists of the abbreviated form of the name in a red serif font beneath a stylized Red Shell and a pair of wings. 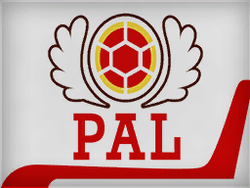 A curved red stripe appears beneath the logo, which all appears on a red background. A variant of the logo consists of the abbreviation on the right of the logo, all in black, on an orange background. It is advertised by means of posters and buses, as well as appearing on departures boards and being referenced on a map. Paratroopa Airlines flights from the Sunshine Airport departures board. 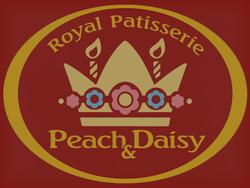 A Peach & Daisy Royal Patisserie logo. Peach & Daisy Royal Patisserie is a sponsor that appears in Mario Kart 8 and Mario Kart 8 Deluxe. Presumably, the company is a patisserie run by Princess Peach and Princess Daisy. The main logo consists of the company name written in a gold serif font curved around the main logo in a gold circle on a burgundy background. 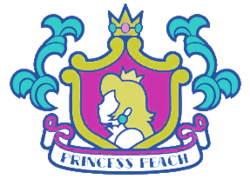 The main logo itself consists of a stylized cream version of Peach and Daisy's crowns, but with an extra line at the bottom and five jewels shaped like Daisy's emblem visible, with two gold dots at the edge. The middle jewel is pink with a cream center, then a blue one with no center, and then a solid pink one. The logo also has two candles in between the peaks at the top of the crown. The logo has many variants, the main one being the trackside banner, version which removes the circle and places the name either side of the logo, while the other main trackside banner has a cream background and everything else in brown. Another variant retains the circle, but has a beige inner background and burgundy detailing, while one adds an extra rim in brown with the background, and beige detail. Two variants are partially circular, one with a burgundy background and gold detailing, while the other has a beige background and burgundy detailing. The patisserie also has a poster with the logo in burgundy at the top, in front of an image of Sweet Sweet Canyon with a gold and then pink border, which has rainbow colored spots on it. It is advertised by means of logos, cookies, cookie boxes, posters, stickers, trackside banners, bottles, menus and shops, and appears on varnishes. A Peach and Daisy Royal Patisserie trackside banner. A Peach and Daisy Royal Patisserie poster. A Peach and Daisy Royal Patisserie logo. Princess Peach is Princess Peach's racing team and a sponsor in Mario Kart 8 and Mario Kart 8 Deluxe. It is one of the six racing teams for each of the characters that have appeared in every Mario Kart game since Super Mario Kart. Their logo consists of an image of Princess Peach like the one from the stained glass window on Princess Peach's Castle in a pink shield with gold edging. The shield feature's Princess Peach's crown on the top, and a white sash across the bottom with a pink lower edge and the team name on it. The logo also features two curled designs in the top two corners, and the entire logo is outlined in blue. The team is represented by means of crowd banners, trucks, standings boards and pit areas. A Propeller Toad Transport logo. Propeller Toad Transport (often abbreviated to PTT) is a sponsor that appears in Mario Kart 8 and Mario Kart 8 Deluxe. Presumably, the company is an airline run by Propeller Toads which mainly specialises in cargo. The main logo consists of a blue stylized Propeller Toad's head, alongside the abbreviation in a sans-serif font, which has speed lines coming off of the "T". The logo also has a few variants, one of which uses blue for the background, yellow for the Toad and white for the text, while another is simply the Toad's head in blue on a yellow background. The other main variant is the logo all in black on an orange background. Another variant uses the main logo, but changes its color from blue to yellow and has a green background. There is also a logo which is mainly the blue Propeller Toad's head, with the full company name in blue in the top right corner on a white background. The writing from this logo also appears on its own as a logo. It is advertised by means of crates, planes, departures boards, trackside banners, signs, logos and trucks, and also appears on a varnish. Propeller Toad Transport flights from the Sunshine Airport departures board. A Propeller Toad Transport trackside banner. A Shy Guy Metals poster. Shy Guy Metals is a sponsor that appears in Mario Kart 8 and Mario Kart 8 Deluxe. Presumably, the company is a mining business run by Shy Guys and is responsible for the mining in Shy Guy Falls and Wii Wario's Gold Mine. Their logo consists of a red Shy Guy holding a pickaxe and mining at a gemstone (similar to those seen in the aforementioned courses), alongside the company name, in an all capitals metal effect font. Beneath the company name is a line, and then "Since 1987", a reference to the release date of Yume Kōjō: Doki Doki Panic, the game in which Shy Guys first appeared. The entire logo appears on a gradient checkered background within a gray oval. It is advertised by means of posters. A Super Marine World trackside banner. Super Marine World (also called Super Marine World Dive Shop) is a sponsor that appears in Mario Kart 8 and Mario Kart 8 Deluxe. Presumably, the company is run by Dolphins and sells diving equipment, including the goggles that they wear. The company name is a reference to Super Mario World, the game that Dolphins first appeared in. Their main logo consists of "Super Marine World" written in the main Mario font in blue, pink, orange and green with a white outline, and "Dive Shop" in a different pink font. The background of the logo features an image of a Dolphin on a blue background. The logo has one variant, which changes all of the writing to pink, and adds a splash behind the Dolphin, which has been slightly re-angled. It is advertised by means of trackside banners. Toad City Sightseeing is a sponsor that appears in Mario Kart 8 and Mario Kart 8 Deluxe. Presumably, the company is run by Toads and runs tours around the city in which the updated N64 Toad's Turnpike is situated, presumably Toad City. The company logo consist of the company name in orange writing with a yellow outline above a white skyline of the city on a red background, with a large tower extended upwards between "Toad City" and "Sightseeing". It is advertised by means of buses. A Toad Mushroom Powered logo. Toad Mushroom Powered is Toad's racing team and a sponsor in Mario Kart 8 and Mario Kart 8 Deluxe. It is one of the six racing teams for each of the characters that have appeared in every Mario Kart game since Super Mario Kart. The logo consists of Toad's emblem with a thick gold outlines, and a pair of gold laurel wreaths on either side. A red banner with a white outline covers the bottom of the emblem, and says "Mushroom Powered" in a curled yellow font. 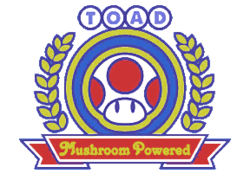 Four white circles appear across the top of the logo, each containing a single blue letter of the word "Toad", and the entire logo is outlined in dark blue. The team is represented by means of crowd banners, trucks, standings boards and pit areas. A Toad Polar Expedition 2014-2015 logo. Toad Polar Expedition 2014-2015 is a sponsor that appears in Mario Kart 8 and Mario Kart 8 Deluxe. Presumably, the expedition is run by Toads and the expedition is to Ice Ice Outpost, where various pieces of their equipment can be seen, while the dates of the expedition reference the release dates of the game and the DLC packs. The logo consists of an iceberg in front of a blue globe with white lines and laurel wreaths on it, in a yellow circle. The circle has the expedition name around the top in an all capitals, sans-serif dark blue font with a lighter blue star between each word, and the dates at the bottom, all on a mid blue background. The logo has several variants, three of which just use a white version of the logo on a red, blue and orange background respectively. The other variant is the trackside banner one, which changes the yellow circle to light blue and the stars and writing to white. This part of the logo appears on the right of the banner, which has a yellow background, while the expedition name is written again in the dark blue font, with "Toad" and "2014-2015" bordered by stars above the line and "Polar Expedition" below it. It is advertised by means of boats, cans, tents, tracks, containers, trackside banners and logos. Ice Ice Outpost Boats, cans, tents, tracks, containers, trackside banners, logos. A Toad Polar Expedition trackside banner. A Toad Polar Expedition logo. Toad Services is a sponsor that appears in Mario Kart 8 and Mario Kart 8 Deluxe. The company appears to be a services chain run by Toads. The logo consists of the company name in an all capitals neon blue font, with "Toad" on the top line and "Services" on the bottom. It is advertised by means of services, signs and logos. A Toad Toy Store logo. Toad Toy Store is a sponsor that appears in Mario Kart 8 and Mario Kart 8 Deluxe. The company appears to be a toy store chain run by Toads, that both stocks toys and manufactures and sells their own. 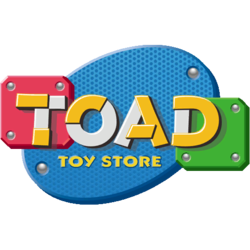 Their logo consists of the word "Toad" written in an all capitals white font, with sections of the letters overlaid with yellow shapes, and "Toy Store" written underneath in a yellow all capital font. The writing appears on a 3D effect blue dotted oval and red and green Empty Block-like shapes, which are seemingly bolted together. The logo's variant removes the shapes from the background, and replaces them with a plain mid blue background. It is advertised by means of logos, signs and shops. Several large Toad Toy Store buildings appear in Toad Harbor, which collectively appear to be a superstore. The side walls of the building are mainly pink, with elements of blue and logos on it. The walls feature beige pillars, with red and gray circles, green tiling, as well as Anti-Gravity Panels and Ramps, with a green section with windows at the far end. The roofs are styled to look like 1-Up Mushrooms, green with white spots, and Super Mushrooms, red with white spots. In an earlier version of the game at the E3 demo, the green section with windows was absent, and in its place was another pink section with checkerboard windows. Additionally, GBA Ribbon Road features Toad Toy Store logos, as well as its box, implying the course was manufactured by and bought from the store. The model Kart boxes also feature the logo, as well as some of the wrapping paper on various gifts around the room. A pre-release screenshot of the Toad Toy Store in Toad Harbor, note the difference of the checkerboard windows. An Undead Motors trackside banner. Undead Motors is a sponsor that appears in Mario Kart 8 and Mario Kart 8 Deluxe. Presumably, the company manufactures and distributes the motors for the Karts, Bikes and ATVs used in game, and is run by Dry Bowser. Their logo consists of the company name in a white gothic font with the serifs shaped like bones either side of a Dry Bowser emblem on a red background. The logo also has a variant, which instead uses a black font and emblem on a pale gray background with darker gray stripes at the sides. It is advertised by means of trackside banners, cans and logos, and is referenced on a map. 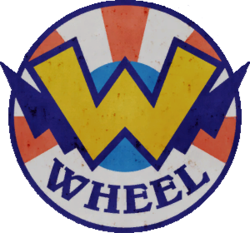 W Wheel is a ride that appears as a sponsor in Mario Kart 8 and Mario Kart 8 Deluxe. The ride is the large ferris wheel that appears before the finish line, with its logos appearing in other places around the park. The ride appears to be owned by Wario, however the individual cars on the ride are both themed around Wario and Mario's shirts and dungarees. Their logo consists of Wario's signature W emblem in yellow with a blue outline in front of a matching blue version of his moustache. The entire logo is on a life ring, with "Wheel" curved around the bottom with the red stripes removed in a blue all capitals font, and the center of the life ring filled in with a paler blue. It is advertised by means of logos and the ride itself. 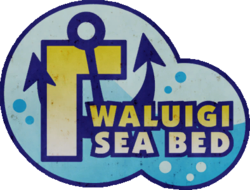 A Waluigi Sea Bed logo. Waluigi Sea Bed is a ride that appears as a sponsor in Mario Kart 8 and Mario Kart 8 Deluxe. The ride is the large white wooden rollercoaster which can be seen in the background of Water Park, to the left of the entrance to the Sub Coaster ride, and is named after Waluigi. Their logo consists of the name in a white and yellow gradient font with a dark blue outline next to Waluigi's upside down "L" emblem in the same font with a dark blue anchor around it. It is surrounded by two dark blue circles with a wave and light blue gradient background with contrasting blue bubbles. It is advertised by means of logos, stickers and the ride itself. Wario Billionaires is Wario's racing team and a sponsor in Mario Kart 8 and Mario Kart 8 Deluxe. It is the only team in the game which is not for a character that has appeared in every Mario Kart game, as Wario did not appear in the original Super Mario Kart. Their logo consists of Wario's purple "W" emblem in a white circle with purple and yellow outlines with a yellow crown with the same outlines. 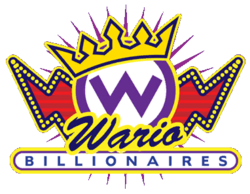 "Wario" is written in a yellow outlined purple script font in front of the emblem, with "Billionaires" appearing in a blue all capital font in a purple and yellow outlined white oval underneath. A striped red version of Wario's moustache appears behind the logo with a thicker purple and yellow dotted outline and a thinner yellow one. A purple star appears behind the whole logo. It is advertised by means of hot air balloons, banners and crowd banners and is referenced on a map. Wendy's Car Interiors is a sponsor that appears in Mario Kart 8 and Mario Kart 8 Deluxe. Presumably, the company, run by Wendy O. Koopa creates the interiors of the Karts, Bikes and ATVs used in the game. This sponsor is the only one in the game which does not have any logos, as it is only referenced on the map in Super Bell Subway. A Wild Yoshi Sanctuary logo. The Wild Yoshi Sanctuary is a sponsor that appears in Mario Kart 8 and Mario Kart 8 Deluxe. The sanctuary appears to be located in N64 Yoshi Valley, as a reserve for wild Yoshis. Their logo consists of Yoshi's Mario Party 9 artwork in an orange circle with gold edging and brown outlines, which says "Wild Yoshi" in an all capitals brown font. Another brown outlined gold banner appears at the bottom of the circle, which says "Sanctuary", and features four Yoshi Eggs around the banner. It is advertised by means of stickers, trackside banners and signs. A Women of Racing Organization trackside banner. The Women of Racing Organization is a sponsor that appears in Mario Kart 8 and Mario Kart 8 Deluxe. Presumably, it is an organization set up to support female racers. Its members include Princess Peach, Princess Daisy, Wendy O. Koopa, Rosalina, Toadette and Birdo, despite the fact Birdo does not appear in the game. The main text for the logos consists of the name written with each word on a separate line in a purple all capitals font with a peach outline and a golden glow effect. All of the logos have a two-tone peach checkered background as well. The main trackside banner features Birdo's Mario Party 8 artwork on the left of the logo, and Princess Peach and the Mario Party 8 artwork of Princess Daisy on the right. The other trackside banner consists of Rosalina's Mario Kart Wii and Toadette's Mario Party 7 artworks on the left and Wendy O. Koopa's New Super Mario Bros. Wii artwork on the right. There is also a poster variant, which puts the images of Princess Peach and Princess Daisy at the bottom with the logo above them. It is advertised by means of trackside banners and posters. A Women of Racing Organization poster. Yoshi Runners is Yoshi's racing team and a sponsor in Mario Kart 8 and Mario Kart 8 Deluxe. It is one of the six racing teams for each of the characters that have appeared in every Mario Kart game since Super Mario Kart. 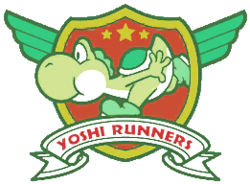 The logo consists of monochrome green artwork of Yoshi running in a red shield with a gold outline and stars. The team name appears in a red all capitals font in a white banner with green edging at the bottom of the shield. A pair of green wings appear at the top of the shield, and the entire logo is outlined in green. The team is represented using crowd banners, vans, gasoline pumps and also appears on various standings boards. A Yoshi's Egg Market sign. Yoshi's Egg Market is a sponsor that appears in Mario Kart 8 and Mario Kart 8 Deluxe. The company appears to be a chain of stores run by Yoshi which sells Yoshi Eggs. The main logo consists a white and green image of two Yoshi Eggs in a nest with "Yoshi's Egg" above it in a green all capitals font. "Market" appears underneath the nest in six green egg outlines with a letter in each, and the whole logo has a yellow background. The logo also has a trackside banner variant, which moves all of the text to the left and the nest to the right, as well as a poster variant, which places nest next to the word "Egg", and additionally has a white background. It is advertised by means of shops, signs, trackside banners, posters, bottles and is also referenced on a map. A Yoshi's Egg Market trackside banner. A Yoshi's Egg Market poster. 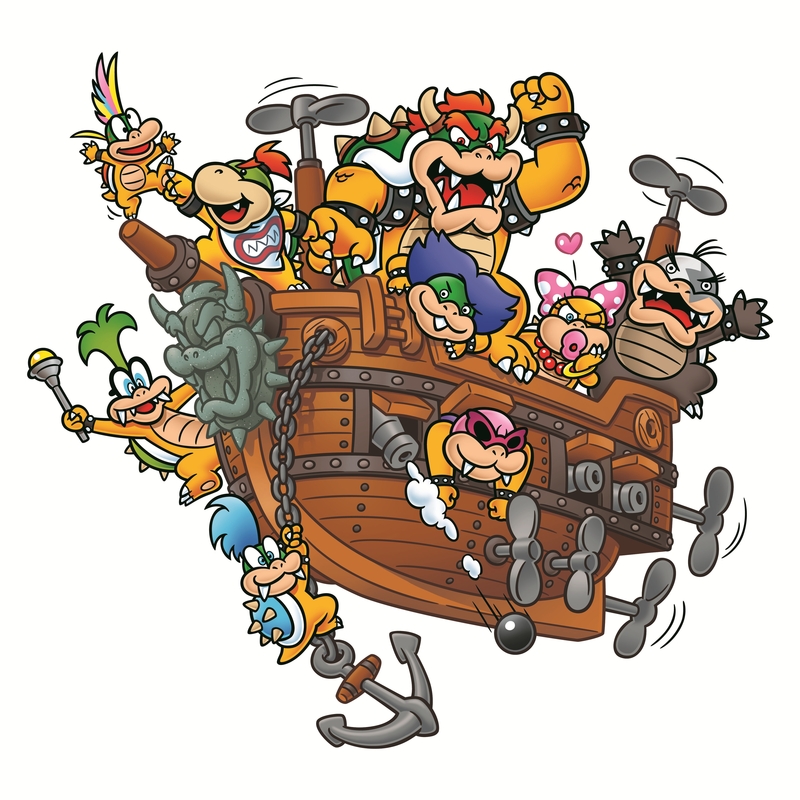 ↑ An artwork of Bowser, Bowser Jr. and the Koopalings on an AirshipMedia:Koopalings Airship Artwork.jpg. This page was last edited on February 28, 2019, at 21:09.